New Summer Bridge Programs A Success! Tyrese Sampson is precisely the kind of Baltimore City high school graduate Grads2Careers was hoping to meet. In spring 2018, he was encouraged by his friend to apply to the Grads2Careers program. 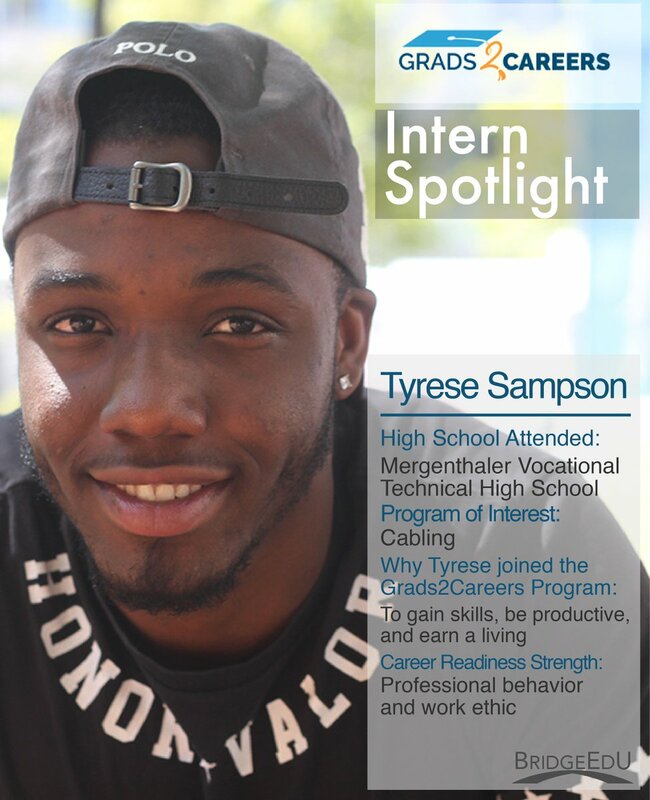 Tyrese is now part of an inaugural cohort of Baltimore City high school graduates and plans to pursue cabling. Cabling refers to all of the underground and above wires and cables that are the backbone of our telecommunications networks. Grads2Careers interns and instructors at the end of summer program celebration. Tyrese Sampson shown on top right in black t-shirt. Grads2Careers offers ten different tracks in automotive, biotechnology, construction, healthcare, information technology, information and communications technology, distribution & logistics, and surveying fields. Grads2Careers is a partnership between Baltimore City Public Schools, the Mayor’s Office of Employment Development, and Baltimore’s Promise. In early July, the Washington Post reported that President Donald Trump signed an executive order to bolster vocational training, creating a National Council for the American Workers and a Workforce Policy Advisory Board. The new push aims to increase the number of skilled workers in the U.S. workforce, at a time when many companies are struggling to find qualified employees. As part of our mission, BridegEdU’s career and college pathways programs prepare young people for their career goals. This summer BridgeEdU launched two new bridge programs, one focused on workforce prep, and the other supporting students in their transition to college. BCCC MSP Success Coaches in their Scholar Pride t-shirts. Summer youth employment programs are relatively popular national strategies proven to reduce violence and property crime among participants. But not all work experiences are equal, and little research exists about how these programs achieve impact or influence long-term employment and educational outcomes: some include learning opportunities and engaged supervisors, but many do not. What sets BridgeEdU apart? We design our programs to address specific challenges so that the students and institutions we serve can achieve measurable success. Overall lack of college or career readiness, low self-confidence, and limited family support to persist through the training program. Lack of awareness of the value of post-secondary options to attain a sustainable career. Minimal to no financial literacy or planning skills. Building confidence, social capital, and a community of learning resources through workforce experience and skill-development courses to reduce learning anxiety and practice using support resources. Reflecting on workforce experience to set career-minded educational goals and boost agency in their learning journey. Providing financial aid and financial literacy training so that students can create personal budgets, develop a relationship with a banking institution, and save for their future. You can learn more about BridgeEdU’s success in working with community colleges here. Interested in learning more about our other retention service offerings? Connect with our team by clicking here.